In Super Mario Bros., Mario has a pretty rough day. He's forced to rescue a princess completely on his own, which seems suspicious given the fact that most royal families have designated security details at their disposal. What kind of third-rate dynasty hires a plumber to save an heiress? Despite being woefully under-qualified, Mario agrees to transport to a magical world where he runs, jumps, swims, and kills everything in sight to get to a castle where a smartass toadstool tells him the princess isn't there. He does this seven different times before getting it right. Besides the psychological damage of all that growing and shrinking, killing, and repeated dying, what kind of physical toll is Mario subjected to? As brilliant reader John D. asked, how many miles does Mario have to travel before he finally gets to Princess Peach? To figure this out, I took Ian Albert's level maps that he painstakingly stitched together from screenshots (check out his website and amazing maps here) and measured their width. 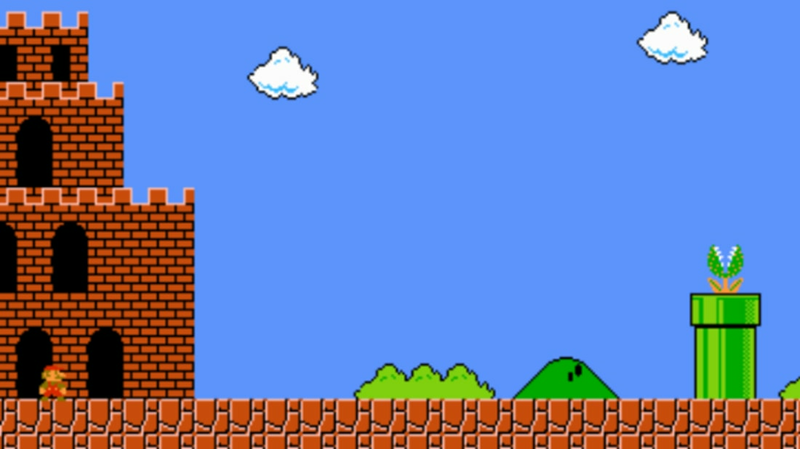 In the NES version of the game, Mario's relative size (in his smaller, pre-mushroom ingestion phase) was then calculated as if he were a normal human man. He stands astride, so the measurements were based on an approximation of someone with their feet slightly more than shoulder-width apart, or 26 inches. If we assume Mario takes a route with no bonus areas or warps, the total distance from his initial starting point to the final castle is about 17,835 feet, or 3.4 miles. But what about the water levels? If you isolate these, Mario swims an estimated 1218.5 feet, or 371 meters, during his ordeal, which is about 7 and a half laps in an Olympic-sized pool. The longest single level is the eighth world's first stage, and it comes in at about 1039 feet. The shortest is world four, stage three, which is around 425 feet long. If Mario does in fact visit every bonus area, the total distance he travels increases by 1574 feet, and his full journey becomes about 3.7 miles. Of those bonus areas, 344 feet are underwater, so Mario tacks on another 105 meters to his swim total. Mario doesn't go in a straight line and he is occasionally transported to different locations and worlds, so these numbers are just an approximation. But think about all the time you spent toiling away at your NES. All those hours and days spent mashing buttons—jumping on Goombas, falling into abysses, ducking projectiles—all that work resulted in little more than Mario completing a 5K to raise awareness for princess theft. Thanks to reader John D. for the question and idea. All screengrabs are from ian-albert.com.